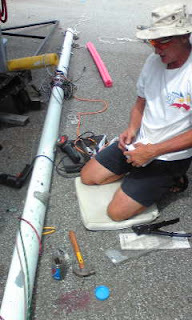 KADENA MARINA, Japan -- (6/27/09) Delaine Rivenbank donated two spreader parts for Scarlette's mast to help quicken the mast project. 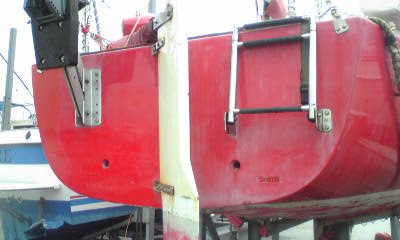 Last week when the mast was lowered, one of the spreaders -- the piece that holds the standing rigging off from the mast. "I was just about to throw those away," said Rivenbank. 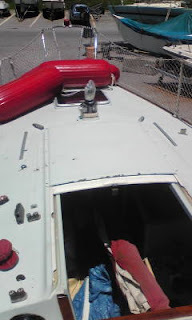 Not only did Rivenbank donate the parts he also helped grind off the broken piece and rivet the new piece to the mast. KADENA MARINA, Japan -- (6/15/2009) --Rainy season is changing plans for Scarlette slightly. 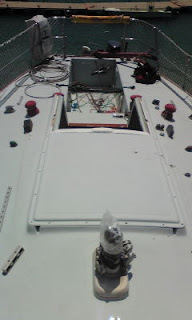 On rainy days will work on inside & rainless days will scrape/paint bottom. 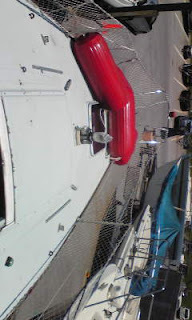 Going to try to get the boat back into the water as quick as possible this year so I can get as much sailing in as I can get.